Exquisite and distinctively beautiful earring set that will adorn a lady's ears with definite grace. 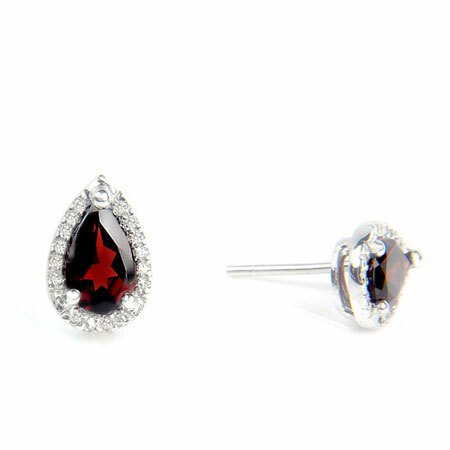 This pear-shaped garnet stud earrings is one of the few that indicate the wearer's tastes. Crafted from 925 sterling silver, each earring is shaped like a pear while sitting on a single strand that serves as the placeholder for the clasp. On top of this sterling silver base is the 1.78 Carat pear-shaped garnet gemstone which is held down by three prongs at both lower ends of the pear shape as well as its pointed tip. The gemstone which is 8mm x 5mm in size, is surrounded by 0.10 Carat diamonds, numbering 32 creating the halo effect while increasing the luster of the earrings. We guarantee our Pear-Shaped Garnet and Diamond Halo Stud Earrings in Sterling Silver to be high quality, authentic jewelry, as described above.